It looks like a lot of people had this same problem as many times I was getting hits to this blog post. One of my friends just traded in three of his old Macs and got a MacBook Pro Retina. I’ve had mine Retina MacBook Pro for a couple of months, and it’s worked great. Except for yesterday it started to have an intermittent screen flicker problem. At seemingly random times, the screen would flicker, refreshing parts of the screen, mostly from in the bottom 50%. This was a real pain given the Retina Display is one of the main features of the new MacBook Pro. After looking at some mac forums to see about the problem, and found no good answers. Wondering whether I would have a warranty event which would be another pain. I remembered I was playing around with MapGL in Google maps, and Safari was not compatible. In order to use MapGL I needed to enable WebGL in the “Develop” pull down menu in Safari. That’s when the screen flicker problem started after WebGL was turned on. So, let’s turning off WebGL, reboot. Screen flicker problem is gone. Wooh! glad there is nothing wrong with my hardware and I am not hunting all over to figure out how to fix a screen flicker problem. For you Mac users, which is about 22% of GreenM3 readers, you may find this screen flicker MapGL tip useful. 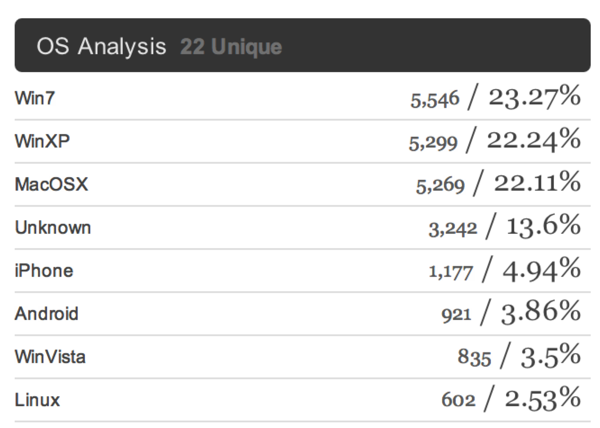 I am surprised that 4.94% are from iPhone and 3.86% are from Android. Here are the smallest % of readers. It is funny to think these devices hit this blog.